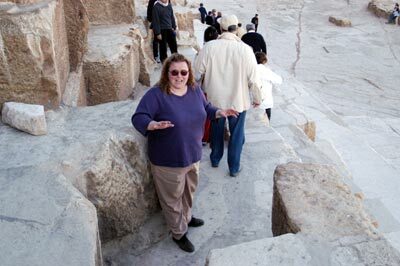 I think that every tourist in Egypt wants to go into the Great Pyramid -- for many, it i the highlight of the trip. 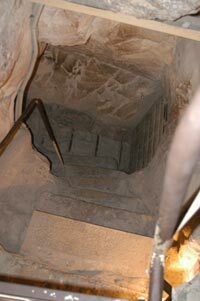 Climbing into this man-made edifice of stone, thorugh the steeply slanted access shaft and into the Grand Gallery. 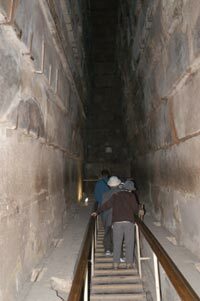 From the entrance there is a short descending corridor and then a steep passageway up into the center of the pyramid. 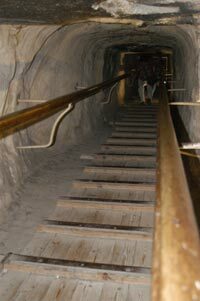 The tunnel (which requires you to climb a bit bent over) leads to the grand gallery, a vaulted and arched staircase leading to the King's Chamber --a lthough as far as we know, no one was buried in it. Below it lies the Queen's chamber. Again, no queen was buried here, it is just named so because it is below the kings. 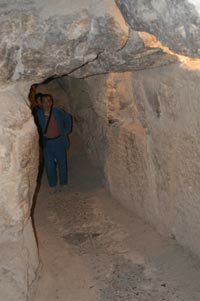 The tunnel is 36 m long, and only about 1.6m high and runs at a 45 degree angle. The Grand Gallery is 47m long and continues at the same angle. THe roof is 8m high. Far beneath the bedrock of the pyramid is an unfinished chamber (which you can't visit at this time). We were in the first small group of peopel climbing up into the pyramid, following one of the guides (who must make this trip about three hudnred times a day!) and once I reached the little landing just before the Grand Gallery...I suddenly realized that I'm claustrophobic. I never had been before, and certainly the gallery is 30 or more feet tall, so it's not even closing in on me...I just couldn't do it. I sat and held hands with a nice Italian woman who had the same problem and waited for Mark to return. The inside of the pyramid is entirely undecorated -- tehre are no reliefs, no carvings, and other than graffiti, no marks at all that can be seen. In some of the suyperstrcuture of the King's chamber, however, are graffiti talking about the work gangs building the pyramid and attributing it to Cheops.